and I picked up this new product! 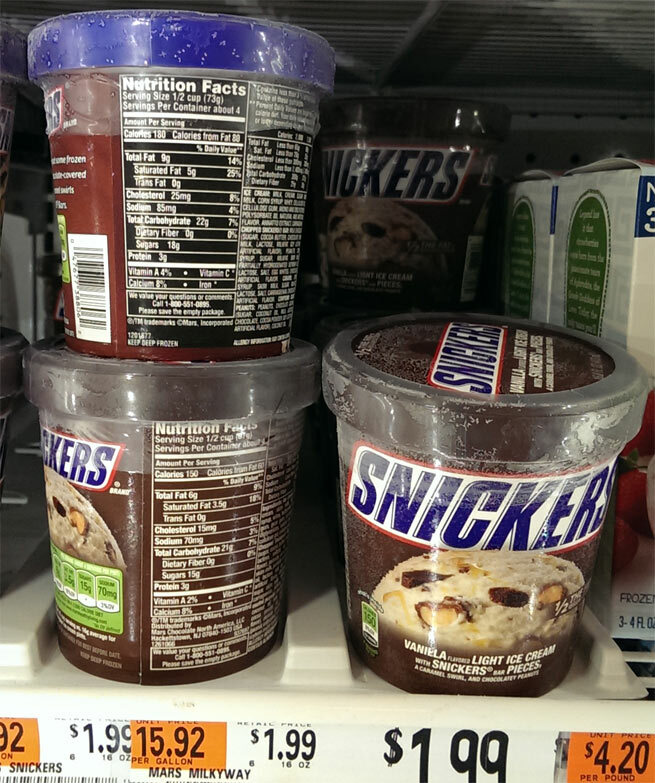 As was the case with the M&M's ice cream, Snickers also now has it's own unique pint of ice cream. 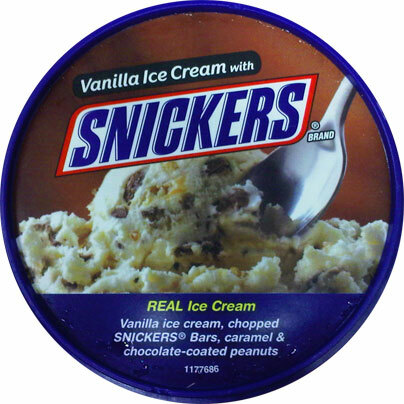 SNICKERS Real Ice Cream describes itself as Vanilla Ice Cream, chopped SNICKERS Bars, caramel and chocolate covered peanuts. Gotta sample the lid first, don't want to waste. Ok, I've dug down a bit and I'm starting to get disappointed. 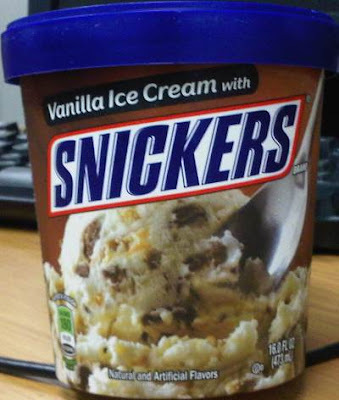 It's not bad, and it's ice cream, but it's not really SNICKERS ice cream. another peanut, tastes like a roasted peanut fresh out of the shell. It's kinda funny because the flavor is so intact that it overrides it's chocolate coating. Right now it's the most unique part of the ice cream. Ice cream texture is decent but kinda gritty. It's part skim milk so a serving comes in at 73g, so let's call it a light ice cream really. It's not gummy, it's definitely solid, but gritty is the only word really coming to mind. another peanut, still no candy bar hunks. if you put bar bits as number two on the description, then I really should be tasting bar bits. I'd much rather be eating a SNICKERS blizzard right now. Ok, I'm full enough. This just isn't exciting me enough to keep going. Well, that was disappointing. 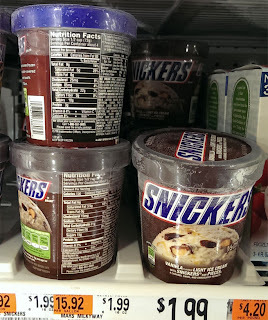 In fact, it's basically the same result I had with the Breyers Snickers Ice Cream awhile back. I guess I just don't get it. Why is it so hard to make a decent Snickers ice cream? Now, granted, I am an immense fan of the Snickers bar and when I need a candy fix because I count on Snickers to save me more than any other candy bar. Maybe I'm being too hard, but darn it, I demand nothing but the best from Snickers and this does not make the cut. On Second Scoop: Well, it's Friday and I decided to have a quick dessert with my lunch... a quick, disappointing dessert. I just don't get it. Why not make the base ice cream peanut nougat flavor? Now add in a hearty amount of respectable sized snicker bits and you have one of the best ice creams ever! I'm sure they will say it's a cost issue, but until they fix it, chalk this one up as a FAIL. 2013 Update: I don't know if it's a good sign or a bad sign, but Mars has tweaked this down to a light ice cream. 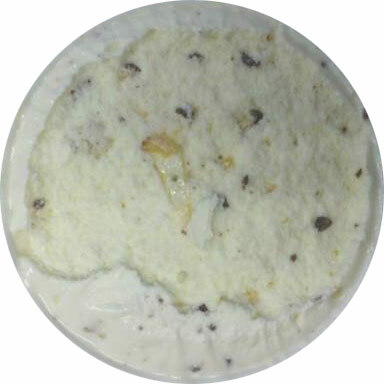 Technically the description is slightly changed as well: "vanilla flavored light ice cream with snickers bar pieces, a caramel swirl, and chocolatey peanuts". I'm in no rush to try this updated version, though it tempting at just $1.99 a pint. I tried this one yesterday (having never read your blog before, just found it today.) I took a few bites and then literally dug all the peanuts out and left the rest in the sink. I didn't even find it worth keeping. Very disappointing. I love it i eat a pint a day plus vanilla ice cream is my fav!! !